What is smart ship? How much should I take? NEVER run out. Automatically receive a new supply at the quantity you selected above, every month. There is NO obligation to continue. Easily pause, change the quantity or cancel anytime by calling 1-800-216-4908 or via our convenient “my account” self-service web portal. Safe natural ingredients scientifically proven to work. HOW CAN ThinMist ™ HELP? … using a complex series of 7 known ‘HGH precursors’. And as the ingredients slowly build up in your system, they can support your body's NATURAL ability to produce youthful growth hormones. Rev up a healthy metabolism so you naturally burn calories at optimal speed. Enhance physical performance, stamina and recovery… so it’s EASIER and more enjoyable to exercise! Promote the development of calorie-burning lean muscle… sculpting your body while supporting your metabolism! Support healthy sleep quality… mood… and energy levels so you naturally start feeling better about yourself and making HEALTHIER CHOICES! Combat unhealthy mood and stress related eating patterns. So instead of relying on artificial stimulants that leave you feeling jittery and queasy once they’ve left your system, ThinMist™ helps you feel NATURALLY energized and motivated, without crazy highs and lows! Supports the organs responsible for balancing blood glucose levels and combat cravings by promoting healthy blood sugar metabolism and positive mood. Supports production of your body's natural “youth” hormone and metabolism so you naturally burn calories at optimal speed. Promotes healthy sleep quality, mood, energy levels, sexual function, and general well-being. The formula is equally effective for both men and women. *ThinMist™ is not an HGH product and does not contain any HGH. It’s nearly impossible to get your daily recommended dose of chromium via your diet. That’s why each spray of ThinMist gives you a 500 mcg mega-dose of high-quality, chromium nicotinate. 1 Chromium Dietary Supplement Fact Sheet. National Institutes of Health. Last Updated March 2018. 2 Med Sci Sports Exec. 1997 Aug;29(8):992-8. 3 Diabetes Obes Metab. 1999 Nov;1(6):331-7. 4 Biochim Biophys Acta. 2017 Sep;1859(9 Pt B):1558-1572. 5 Chromium Dietary Supplement Fact Sheet. National Institutes of Health. Last Updated March 2018. 6 Front Psychol. 2014 5:925. 7 Biofactors. 2006;26(3):201-8. 8 Altern Med Rev. 2007;12(3):274-279. 9 Sleep. 2008 Nov 1;31(11):1499-1506. 10 Minerva Endocrinol. 2013 Sep;38(3):255-267. 11 J Pharm Bioallied Sci. 2013 Apr-Jun;5(2):91-97. 12 Evid Based Complement Alternat Med. 2010 Mar;7(1):137-144. 13 Fertil Steril. 2009 Dec;92(6):1934-40. 14 Obesity (silver Spring). 2017 Mar;25(3):539-544. Traditional Chinese doctors have used elk antler medicinally for centuries. Recent studies show promise for elk antler (velvet) to be useful in fortifying bone health, skin regeneration, and overall wellbeing. 15 Evid Based Complement Alternat Med. 2012;2012:429268. 16 Complement Ther Med. 2015 Oct;23(5):693-8. 17 J Int Soc Sports Nutr. 2013;10:28. 18 Br J Sports Med. 2003;37(5):465. 19 Nutrition. 2001 Mar;17(3):243-7. 20 J Complement Integr Med. 2015 Sep;12(3):175-85. 21 JAMA. 2004 Nov 10;292(18):2243-8. 22 Rejuvenation Res. 2013 Aug; 16(4): 285–294. 23 J Nutr Health Aging. 2010 Aug;14(7):570-7. 24 Anabolic Hormones.© A Dictionary of Food and Nutrition 2005. Originally published by Oxford University Press 2005. 25 Am J Clin Nutr. 1995 May;61(5):1058-61. 26 J Strength Cond Res. 2010 May;24(5):1306-12. ThinMist also contains several other essential and branch chain amino acids – such as L-Valine, L-Isoleucine, L-Tyrosine and L-Glycine – which support healthy body composition, physical performance and metabolism. 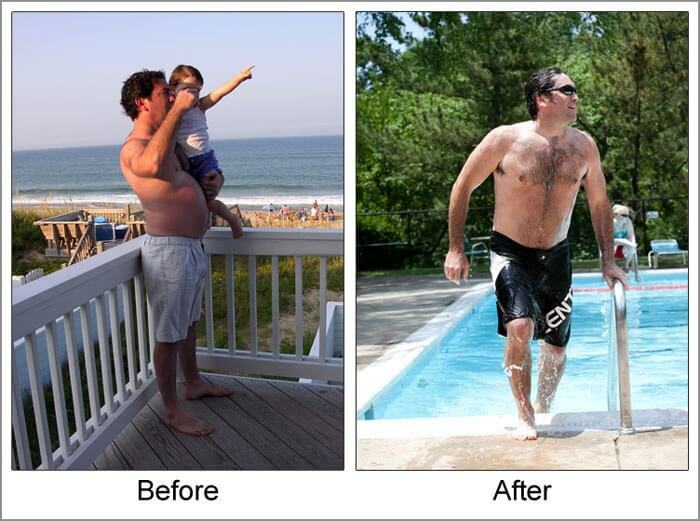 The 46-Year-Old Who Got His Weight Below 200 lbs. ... For The First Time In Over 25 Years! But I'll be darned if the weight didn’t just start falling off. (Despite my lackluster effort.) And while the results weren’t super dramatic on the scale – I was dropping PANT SIZES! Fast...!!! I quickly recognized that, I was replacing my FAT with LEAN MUSCLE, which weighs more than the fat. So the scale wasn't telling the entire story. But wow – my overall body shape was changing. I'm down to 187 lbs. A full 25 lbs. of fat – whoosh – gone! Though, I’ve probably lost even more fat than that because I’ve been gaining lean muscle the entire time. I really should have measured my percentage body fat before I started. But anyway, this new after picture of me was taken after 4 months of supplementation with ThinMist. And as you can see, I'm looking better than I have in YEARS! Plus, I think what's really interesting is how much better I feel. I'm sleeping better... I'm not getting crazy carb or sugar cravings... My energy levels are WAY up... And I'm feeling motivated to continue maintaining these simple lifestyle changes. Honestly, I can't believe how easy this weight loss has been. And I can only imagine how much BETTER ThinMist could work for someone who has more weight to lose than I did... Or, who is more motivated to eat healthy and exercise 3-4 times per week instead of just 2 times like me. At 46 years of age, this is the best I’ve ever looked and felt. I’m happy with where I'm at. NO, it is not. ThinMist™ does not contain Human Growth Hormone (HCG). 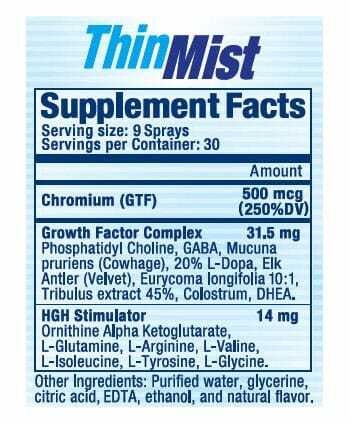 ThinMist™ is not an hCG product nor is it a homeopathic product not does it contain Human chorionic gonadotropin (hCG). 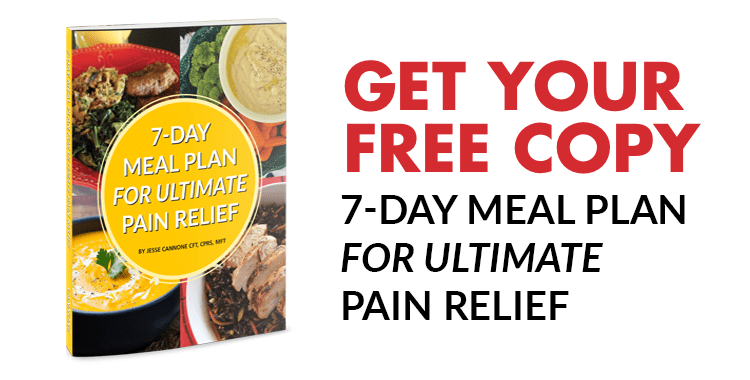 supports you in achieving a more balanced approach to portion control throughout the day. As with all supplements, it is suggested that you consult your physician before taking this or any supplement. Stop taking this product 2 weeks before any scheduled surgery. This product is not intended for individuals under the age of 18. Do not take this product if you know or suspect that you are allergic to any ingredients. As with all dietary supplements, those who are pregnant or nursing should consult their physician. Attention: A person who uses (Insulin is a Diabetes or has Pre-Diabetic symptoms) should communicate with their doctor before starting ThinMist, as the ingredients in ThinMist can make the body more effective at glucose transport/utilization. Attention: Colostrum (an Ingredient in ThinMist) does naturally boost immune response and if the customer is trying to reduce their body's natural immune response the colostrum will counteract that. 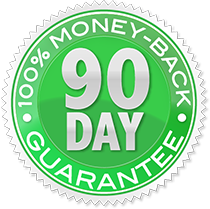 People who are currently being treated with immune modulation treatments will need to work with their doctors directly on what they eat and take in dietary supplements. In the ThinMist formula, we use the liquid form of ChromeMate. ChromeMate is a niacin-bound amino acid chelate form of Chromium. Chromium bound with Niacin is "GTF Chromium". ThinMist contains GTF Chromium as Chromium Nicotinate is the chemical name for GTF Chromium. Regardless of the amount of weight you want to lose, the dose and timing of the product are the same for everyone. For the best results, use the product as follows: Remember to shake the bottle before each use. Direct the pump to spray into your mouth under your tongue. Allow the liquid to remain under your tongue for as long as you can tolerate, but a minimum of at least 30 seconds before swallowing. Morning: 3 pumps within 10 minutes after waking up, 30 minutes before breakfast* Afternoon: 3 pumps, 30 minutes before lunch Night: 3 pumps, 30 minutes before your last meal of the day** *You may drink your morning coffee or tea without waiting for 30 minutes. * If you miss a dose during the day, take your third dose one hour before going to bed. If you would like to give yourself an extra boost, take an extra pump or two at night before bed. This can help keep your metabolism running high to burn off fat even while you sleep. There is one fluid ounce in each bottle of ThinMist. One bottle will last 30 days using the suggested three pumps, three times daily. There are NO Eggs, Fish, Shellfish, Tree nuts, Peanuts or Gluten in ThinMist™. The Colostrum in the ThinMist™ spray is derived from milk. The Phosphatidylcholine is extracted from Soybean oil. The ThinMist is Gluten Free. 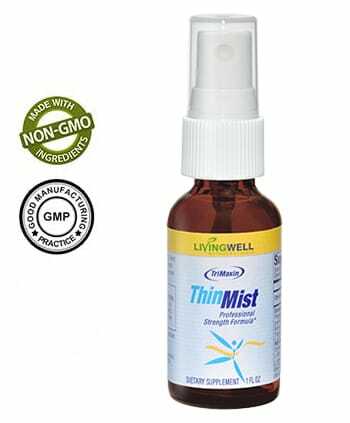 We can not suggest or support the use of ThinMist if the expiration date on the bottle has passed. If you choose to take the product past the expiration date you do so at your own risk. We guarantee you’ll love ThinMist or we’ll refund your money. If you’re not happy for any reason, simply return ThinMist within 90 days of your purchase date for a full refund, less shipping. No questions asked. Simply return your bottle, even if it’s completely empty, and you’ll receive your full purchase price, excluding shipping. Return all your bottles and you’ll receive a prorated amount based on the number of unopened bottles returned, excluding shipping. The dose and timing of the product are the same for everyone, regardless of your body weight goals. For the best results, spray ThinMist into your mouth under your tongue. This is not an inhaler, you are not intended to breathe in the spray, but rather to direct the spray under your tongue and allow the liquid to remain there for as long as you can tolerate, but a minimum of at least 30 seconds before swallowing. Night: 3 pumps, 30 minutes before your last meal of the day. If you miss a dose during the day, take your third dose one hour before going to bed, do not exceed 9 pumps per day. The key to success is to ensure the chromium ingredient is adequate and available so sugars are converted to energy as possible vs. stored as fat. The way the ingredients in ThinMist are formulated and delivered into your body are what make it so effective.